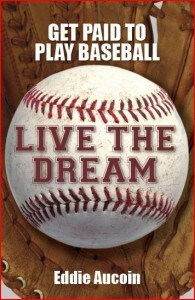 We already introduced you to Eddie Aucoin’s book “Live the Dream – Get paid to play Baseball”. It is a guide for players, coaches and parents to help players of all ages to have a chance in professional baseball. It covers all aspects which are important to reach the big goal. It is really an interesting read with some anecdotes out of the baseball life of Eddie Aucoin, who will return as starting pitcher to the Hoofddorp Pioniers this year. He was so kind to offer the readers of Mister-Baseball.com two copies of the book “Live the Dream – Get paid to play Baseball”, which we will hand out in a contest over the next two weeks. 3) Publish an article on your website or blog about the contest with a link to this article. The contest will end on Sunday, January 23 at midnight CET.